Sgt. Jason Mozel is a Marine veteran who is attempting a Guiness Book World Record. He will be attempting 5000 burpees in a 12 hour period at Snap Fitness in Berlin, VT. The current record is 4,556. Mozel’s personal record is 3000! 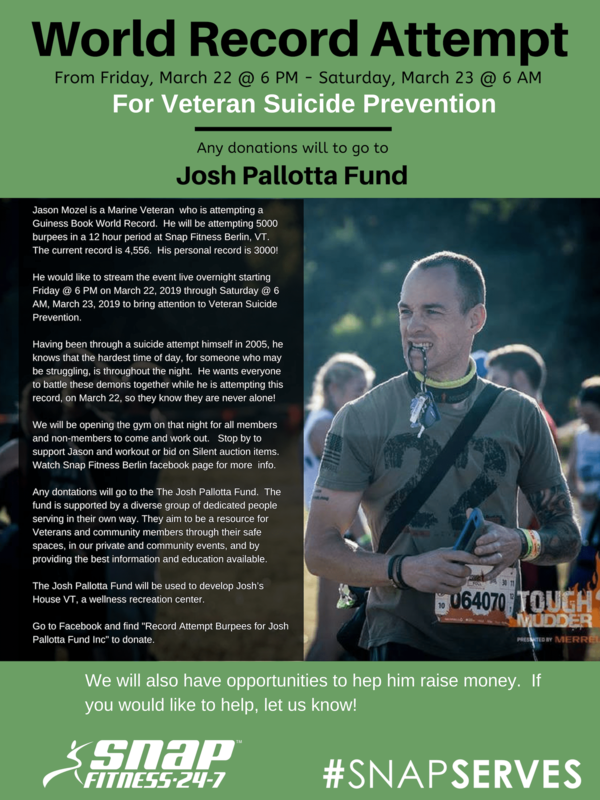 He would like to stream the even live overnight starting Friday, March 22, 2019 at 6:00 pm through Saturday, March 23, 2019 at 6:00 am to bring attention to Veteran Suicide Prevention. Having been through a suicide attempt himself in 2005, Mozel knows that the hardest time of day for someone who may be struggling, is throughout the night. He wants everyone to battle these demons together while he is attempting this record on March 22, so they can know they are never alone! He will be opening the gym on that night for all members and non-members to come and work out. Stop by to support Jason and workout or bid on Silent Auction items. Watch Snap Fitness Berlin FaceBook page for more information. 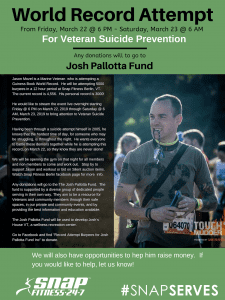 Any donation will go to the Josh Pallotta Fund. The fund is supported by a diverse group of dedicated people serving in their own way. They aim to be a resources for veterans and community members through their safe spaces, in our private and community events, and by providing the best information and education available. The Josh Pallotta Fund will be used to develop Josh’s House VT, a wellness recreation center. Go to Facebook and find “Record Attempt Burpees for Josh Pallotta Fund Inc.” to donate. Snap Fitnesss Berlin will also have opportunities to help him raise money.